One man (and a few friend's) thoughts on Roots music from across the great divide. It wasn’t a pleasant experience as his fans can be very aggressive; but I stand by my words. Which all goes someway to why I’ve fallen love with this album; which has been on constant rotation in my car and office for four days solid now; and promises to stay there for a few more. 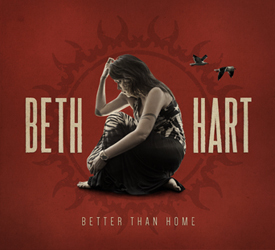 Better than Home opens with the gorgeous and cheery Might as Well Smile; a song that has Beth smiling on the outside as she cries on the inside; and I don’t think she’s ever written a finer song or sounded better. Now ‘clean’ and happily married after a lifetime living the Rock and Roll lifestyle; Beth occasionally looks back at her past; but always from the perspective that future looks a Hell of lot brighter and better; and tracks like The Mood That I’m In and the forlorn As Long as I Have a Song take that theme and let it run until it’s out of her system. That last song wouldn’t have been out of place on one of Sinatra’s latter day albums btw. Now free of cigarettes and goodness knows what else Hart’s voice sounds extraordinary at time here; especially on the thunderously Rhythm and Blues flavoured Trouble; where she spectacularly moves between Rock Goddess and Blues Mama with the greatest of ease. There isn’t even an average song here but there are some that are genuinely spine tingling and smile inducing; take a listen to Gospel-Blues infused St. Theresa; where not only does Beth get to sound like Ella but her piano playing is straight outa the Blue Not studios. My copy has a ‘bonus track’ and it will be a shame if every fan doesn’t get to hear the beautiful Mama This One’s For You; as the simplicity of Beth singing while playing the piano is too good not to share with the world. If I go back to my Joe Bonamassa quote; I think Beth has actually discovered what her voice is actually capable of herself, as she out rocks Tina Turner in her pomp, but delves deep into the Blues of Sister Rosetta and the Soul of Aretha to create the Beth Hart ‘sound’ and it’s a ‘sound’ that deserves a much wider audience than previous offerings have received. Andrew Hawkey – What Did I Come Up Here For? Holly Golightly – Slowtown Now! Danny and the Champions of the World – Champs Live! Kaz Hawkins – Get Ready! My Darling Clementine – How Do You Plead? Police Dog Hogan – Westward Ho!